My childhood memories of Hawaii include soft, sandy beaches, warm wind, and easy living. Although I’ve visited Kauai quite recently, this was my first time back to Oahu in a very long time. Coming back as an adult, I loved it even more than I remembered. The landscape, the food, the activities, the people… what’s not to love? 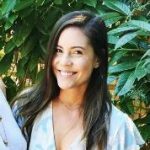 Yes, it’s touristy, but there are so many local secrets to see, and so many non-touristy things to do (plus it’s a great zika-free babymoon destination). 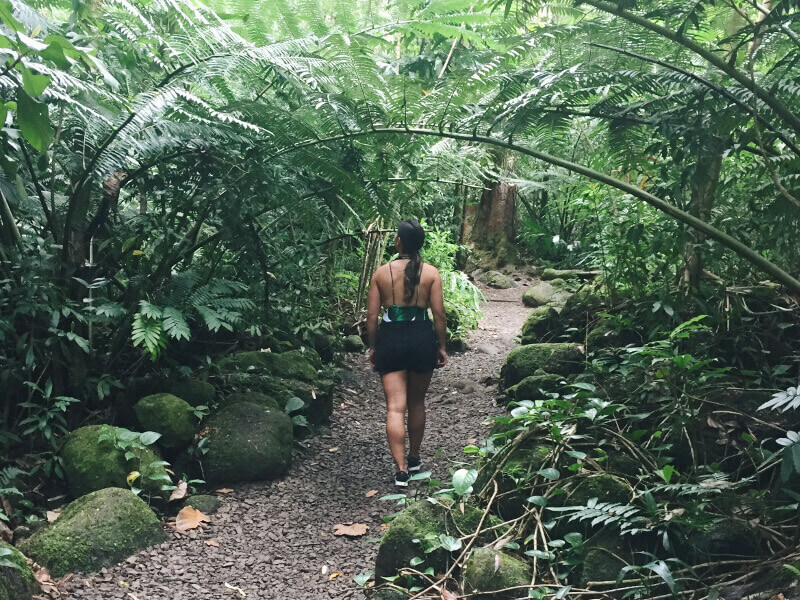 Read on to learn about the best hikes, restaurants, and places to stay in Oahu! 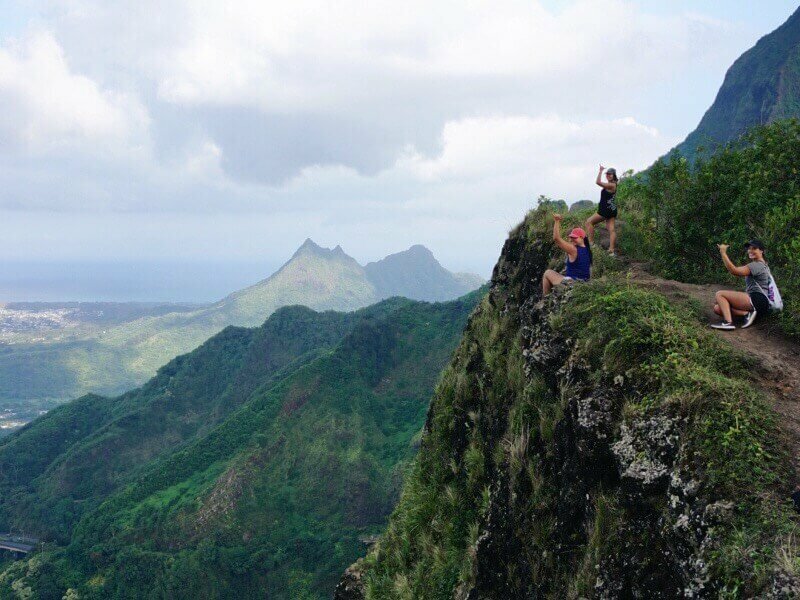 Hiking is one of the best ways to see all of Oahu, and the views of the Pacific never disappoint. Because our AirBnB was so close to Diamond Head, it made sense for us to start with this hike. 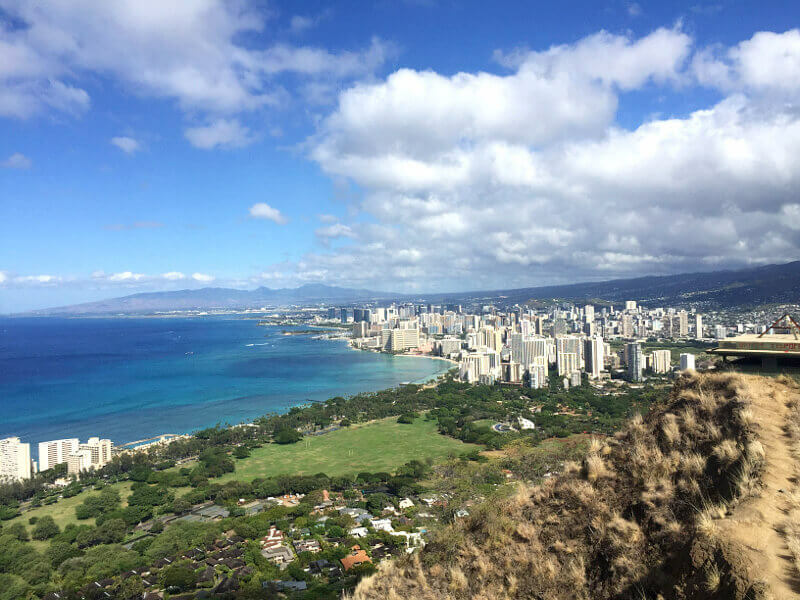 It’s a beautiful, beginner’s level hike with views of the Pacific Ocean and Waikiki Beach from the very top. There are also a few lookout points that are “off limits”, but you’ll get the best view and photos from there, if you’re feeling adventurous. The vegetation on the way to Manoa Falls gets better and better throughout the hike. To escape the heat, doing a rainforest or waterfall trail is ideal. We decided to hike to Manoa Falls, and the trek to get there was breathtaking. 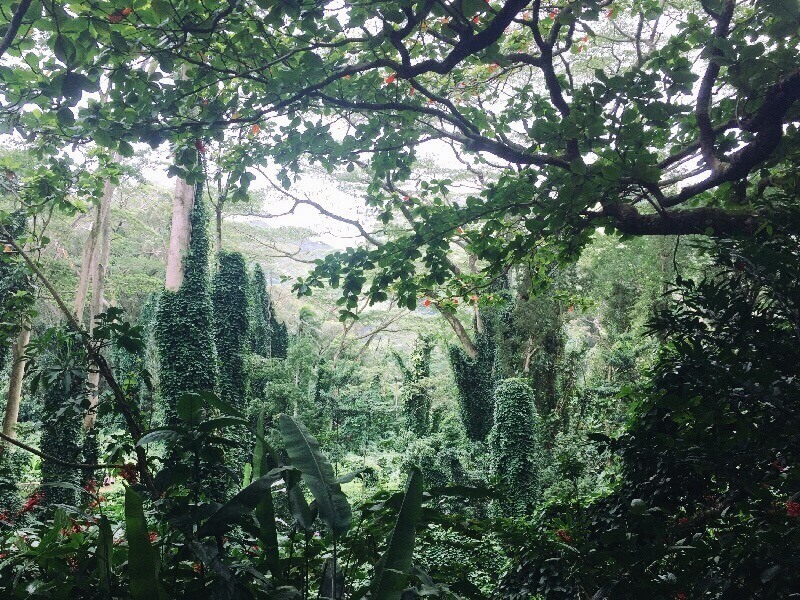 The lush greenery and native Hawaiian flora were enough to make even my mom love the hike! My brother and I had a tough time putting our cameras away because there were so many photo ops along the way. Make sure you wear proper shoes when doing a waterfall hike – some areas can be very muddy and slippery! When you get to the very end of the trail, the waterfall is not the most spectacular thing you’ll ever see, but the trail itself is worth the trip. Other waterfall trails in Oahu include Lulumahu Falls and Maunawili Falls. I’ll be checking those out next time! 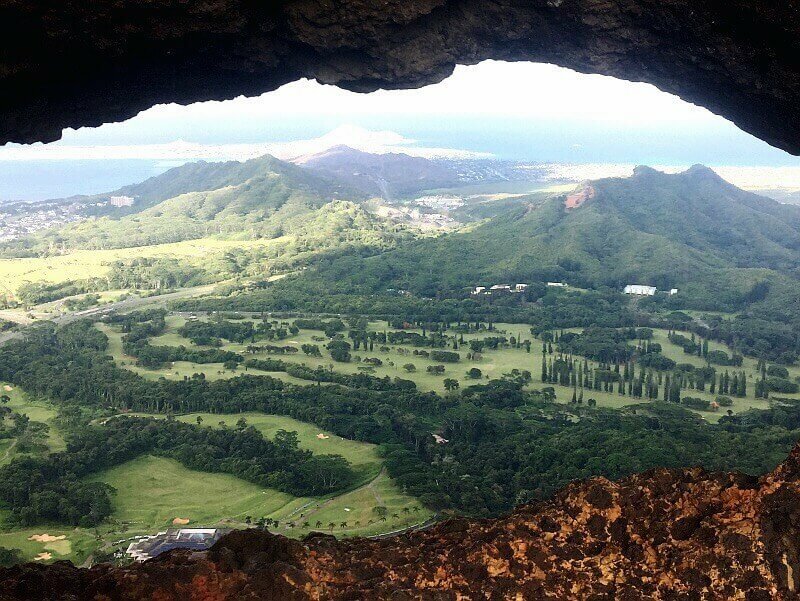 The view at the top through the Pali Puka, Oahu’s natural lookout hole. I knew I was in for a challenge when our local guide was a little nervous before the hike, but I still didn’t know what I was getting myself into. Pali Puka is a hidden trail (not advertised for a reason), that locals like to frequent. The reward? A natural lookout hole in the side of the volcanic rock that overlooks Nuuanu Valley. You’ll have to hike along the outside of the mountain at times, so stay low to control your balance. This hike is not for beginners, especially if you take the outside trail along the edge of the mountain like we did. I get nervous just thinking about it! The inside trail is much more achievable with branches and vines to hang onto, but you will have to make your way on the outside at some points of the hike. To help you along the steep climb, there are ropes to pull yourself up. When those aren’t available, stay low and grab onto any branches you can find to make sure you don’t fall backward. You’ve been warned – be very careful on this hike! The lookout at the top and the feeling once you complete the hike is worth it, I promise! Follow the Makapu’u Lighthouse trail to begin your descent to the Makapu’u Tidepools. If you’re up for a rocky adventure, I highly recommend hiking the Makapu’u Lighthouse Trail, and scaling down the cliff to swim in the tidepools alongside the ocean. To get there, make your way up the paved lighthouse trail until you see the third rest stop with a sign about humpback whales. To the left of the sign, start your descent, and follow the white painted arrows on your way down. Make sure you wear runners or supportive shoes, and be very careful where you step, as some rocks are loose! Thanks to my brother’s sense of direction, we went the opposite way, which was much more difficult and dangerous than the main path (there were multiple times where I thought about turning around)! When you get to the bottom, it’s heaven on earth. 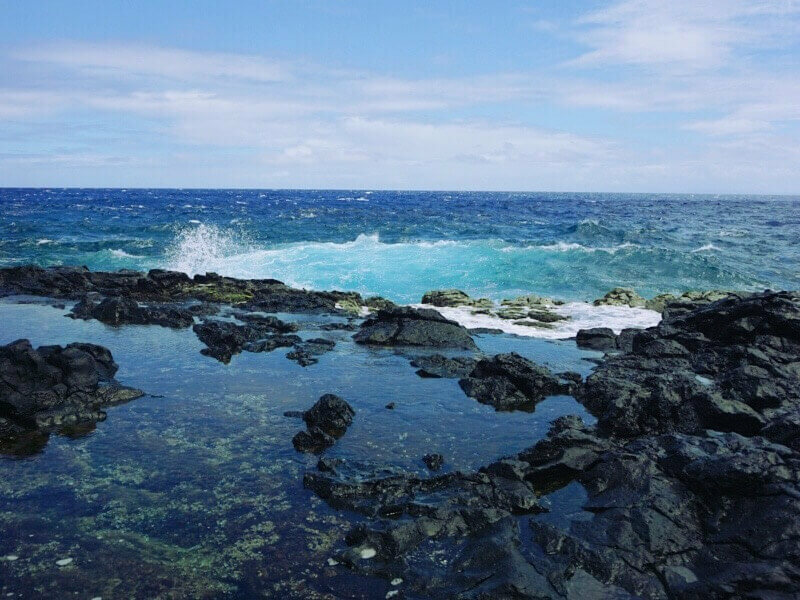 The waves crash against the lava rocks and fill the blowholes while you swim in warm, natural infinity pools. I’m dreaming about going back already! 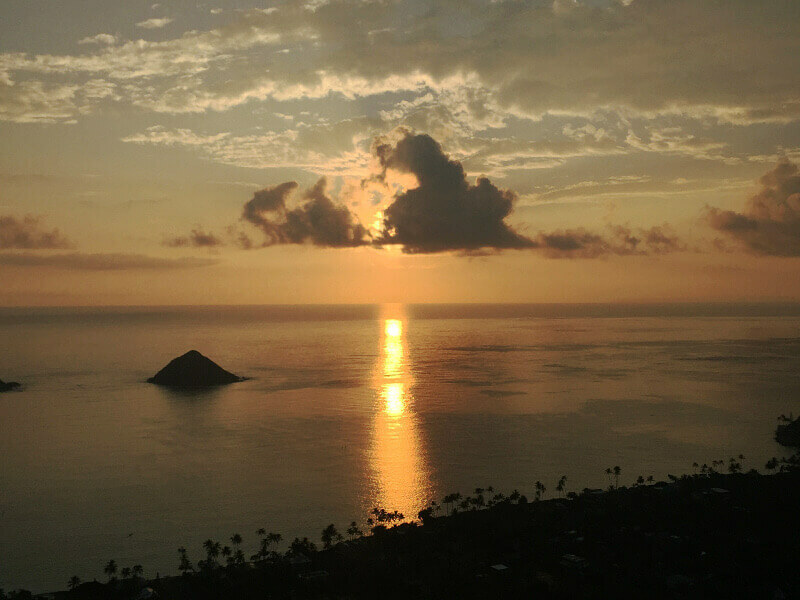 Early bird gets the worm – and the sunrise at the top of the Lanikai Pillbox Trail. My favourite hike was Lanikai Pillbox Trail. We set out before sunrise to make sure we could watch the sun glisten over the ocean. The trail is easy – even kids can do it! At the very top is an incredible panoramic view of Lanikai Beach. 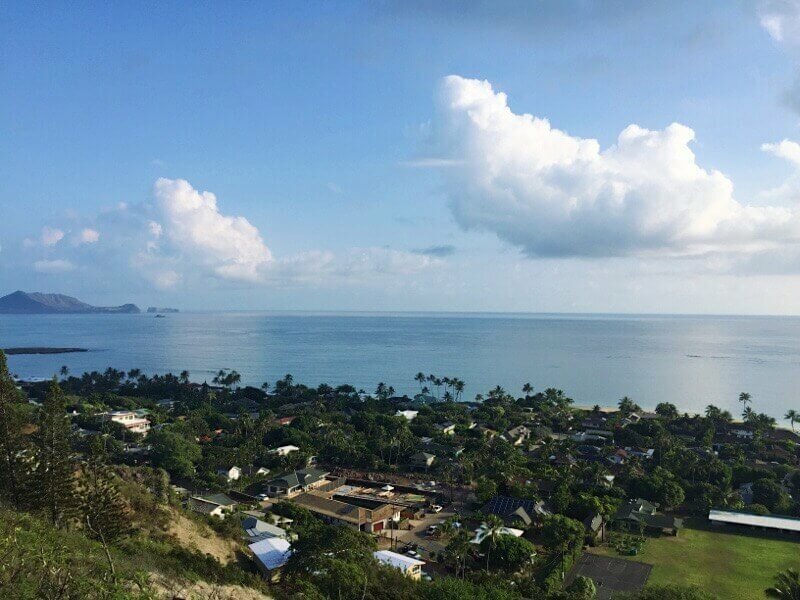 You can also see all of Kailua, with palm trees lining the ocean shores, as well as Chinaman’s Hat, also known as Mokolii Island. After one of our hikes, we were all very hungry, so we went to Cinnamon’s for their famous pancakes. If you’re not much of a “sweet breakfast” type, they have tons of savoury, traditional options on the menu too. Their most well-known pancake flavours are Guava Chiffon and Red Velvet with White Chocolate. Both on the sweet side, but definitely worth a try! Yes, there’s a lineup outside at almost any time of day, but if you head there around 11:00 am on a weekday like we did, you can breeze right through, and everything will be fresh! The lineups are for good reason: it’s a fast, counter serve Japanese restaurant that’s extremely affordable. Marukame has a few flavours of udon to choose from, along with almost every type of tempura you can think of, including Chicken Karaage! My favourite item on the menu was the Curry Udon – a little spicy and full of bold flavour. As you enter the restaurant, you’re greeted by this beautiful wall decked out in mini drink umbrellas. 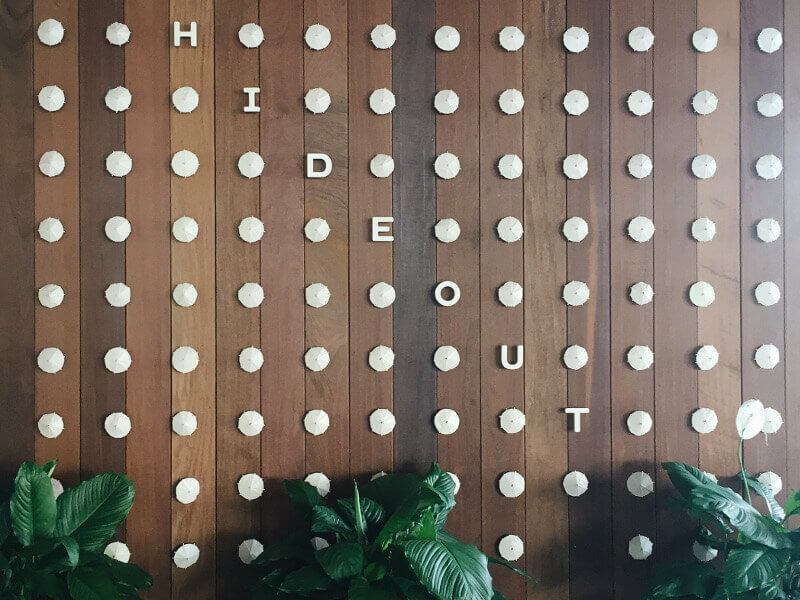 As a design fanatic, I knew I had to visit The Hideout at The Laylow – Autograph Collection. 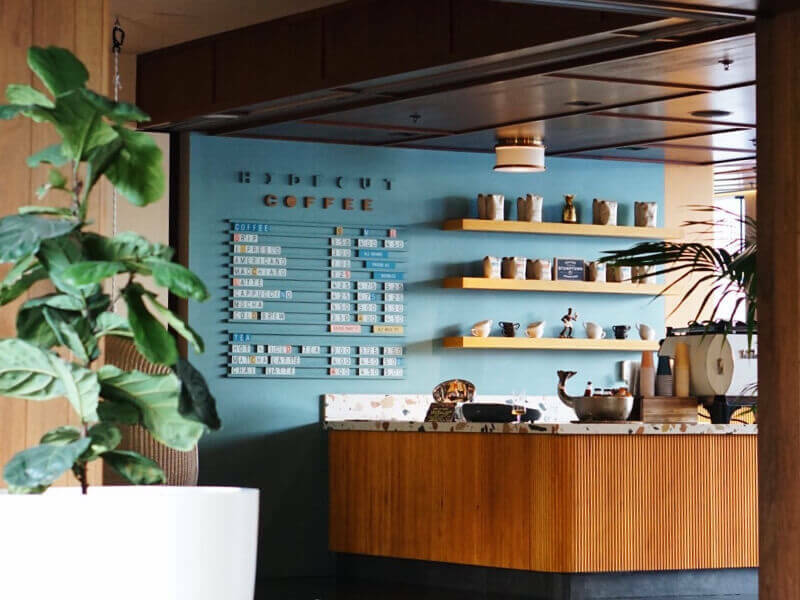 The vibe in both the restaurant and hotel is a super cool, urban sanctuary with plants and modern (yet retro) elements everywhere you turn (cue the design inspiration)! 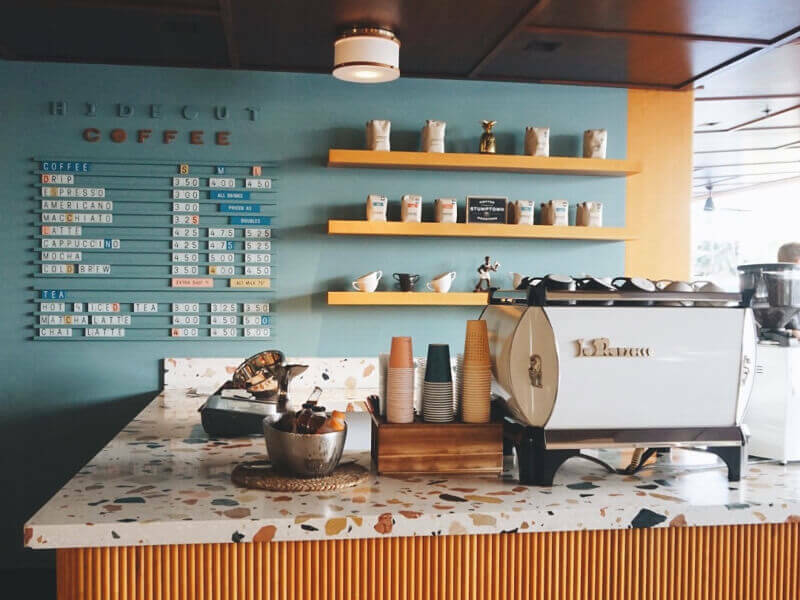 On one side of the restaurant bar is Hideout Coffee, the Laylow’s very own cafe. For drinks and appies, we sat around a sand-surrounded fire pit and moved into the dining area for dinner. The cuisine is mostly Pacific-Asian made with local ingredients and a Hawaiian twist. Their cocktails were superb too, so make sure you keep holiday heart syndrome in mind! It’s safe to say our meal was one to remember, and we enjoyed every second of it. 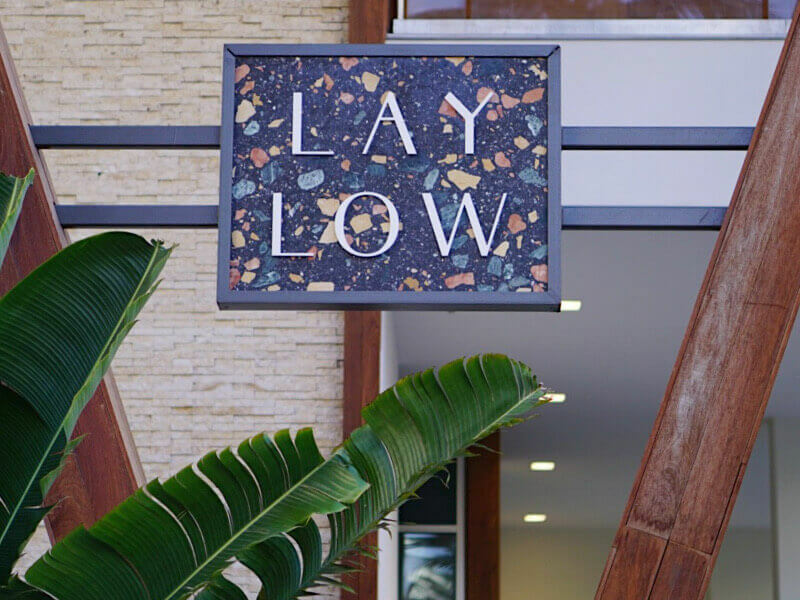 Welcome to the Laylow Waikiki, where the drinks are great and the decor is even better. Surprise, surprise, I highly recommend staying at The Laylow Waikiki. From the escalator entrance to the retro-style coffee bar, every detail in the design has been thought through. Just a peek inside the retro lobby of the Laylow, Waikiki. The modern pool is also a sight for sore eyes, along with the hotel rooms, decked out in the hotel’s signature hibiscus-printed wallpaper. You know where I’ll be staying on my next visit! The million dollar view from the Sheraton Waikiki. On this trip, we had the pleasure of experiencing all that the Sheraton had to offer, and the views from the hotel rooms are spectacular! The colour of the water from your hotel room will simply take your breath away. 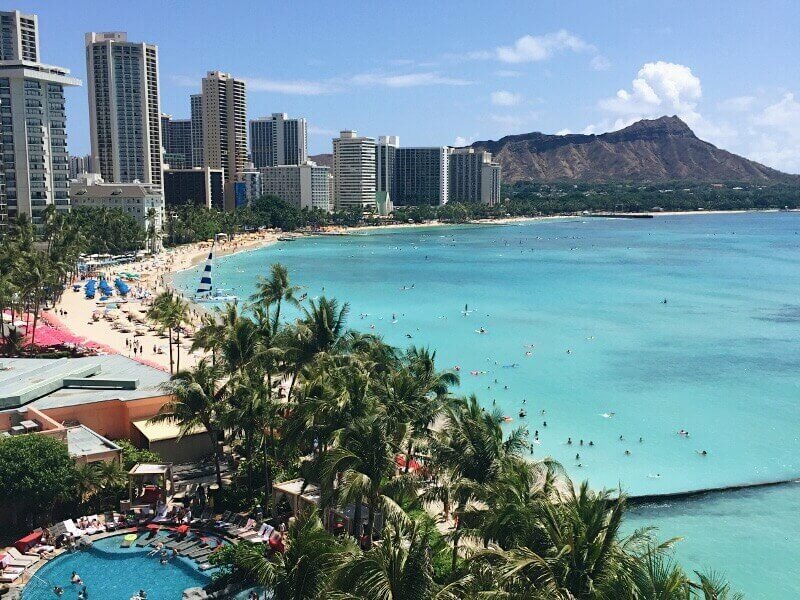 Because it’s located on the west side of Waikiki Beach, you can see the entire strip of beach with Diamond Head in the background. On ground level, guests can soak up the Hawaiian sun in the infinity pool overlooking the turquoise Pacific, and to cool off, the staff will give you frozen grapes while afloat your bean bag chair! If traditional décor is more your style, you’ll fall in love with the Moana Surfrider. As Waikiki’s very first hotel, it’s been a well-established accommodation in Honolulu for over 100 years. It’s a Westin Resort, so you know you’ll get quality service and accommodations for your stay! And if you love high tea, you’ll want to take advantage of their Afternoon Tea service on the veranda overlooking the ocean. Before you leave for the rainbow state, make sure you’re covered with the best travel insurance for your trip. Now that we’ve covered Oahu, where to next?